I’ve been You Tube’ing lately. It is amazing what great works you can find. Speaking of the Seventh Ring in my Labyrinth dream I did in fact find a ring that day on You Tube a Golden Ring no less, a Golden Ring of the Seventh Heaven. It spoke to me in a way that rang true and resonated deep within me. I’ve been listening so some of the transmissions by this person known only to me by the name Rysa. I highly recommended them as I have found the voice to be empowering and aligned with the source of light that is also guiding me. We are called to unite with like minded souls to spread our knowledge of what has been revealed to us to others. He calls us the Wayshowers. I call us Lightworkers or Starseeds. We are known by many names but our calling is to help guide the way and lead the people out of darkness by carrying the lamp of higher consciousness to help awaken humanity out of the dream of life. This morning I had a dream where I am with my best friend Daniel who died many years ago. I am asking him if he knows the whereabouts of my friend Robert who I know also died many years ago. I had lost contact with him years before I found out he had died. Daniel tells me that he knows where to find him. He then takes me to where I can meet him. We find my friend Robert and after a few minutes I ask Robert about our old mutual friend Richard. I lost contact with Richard many years ago and I have no knowledge on what became of him. Robert tells me that he knows where he is. I ask him if he will help reunite me with him. He then takes me to where I might find him. Upon finding my friend Richard, we all sit and chat for a few minutes. I then ask Richard about our mutual friend Augusto. I’m sensing that they are now aware of the trick I am playing on them to help reunite us as one. Still unsure of my motive, Richard naively answers that he does know where Augusto is. We all then travel back in time to a period in our lives when we were all together as one. It is a good and happy time with many pleasant memories. My fiend Daniel and I then leave to find a quiet place where we can continue our talk. I have a room that I rent at a nearby spa and resort which I invite him to. When we come onto the room I draw down the shade so that the management of the establishment won’t become aware that I brought with me a non-member. I’m caught by the management and told that I cannot bring non-members with me into this establishment. Daniel is angry because when he was alive he had a valid membership. He then calls upon the gay community to come with their chisels and picks to chip away at the wall they have constructed to keep people out. I’m thinking they are never going to be able to tear down the wall that separates us but in fact they are. The wall is now crumbling. In tearing down the wall they expose a secret labyrinth. There is a man at its center struggling with a demon that has the head of a bull. I’m told if I want to confront the demon I can enter into the Seventh Ring. Knowing this is my own interior space the demon is occupying, I venture into the labyrinth to confront the demon. He is held behind an enclosed fence at the center of the labyrinth. The demon sees me and immediately jumps over the fence and aggressively comes at me. The shock wakes me up out of my sleep. Now awake with my eyes open, I can see the demon before me. He has the head of a bull and the body of a man. All I can see is the fur around his eyes because his face is pressed up against mine. I can feel his heavy breath upon me. Without a second thought, I snarl back at the beast pushing into him to let him know that I am not threatened by its presence. His image remained beside my bed for a long time as we locked eyes. I could see the red fiery anger in the pupils of his eyes. I had to go to the bathroom so I paid the beast no mind and got up and walked over to the bathroom. Determined not to be frightened I intentionally left the light off and sat in the darkness that was in my bathroom. When I was done I returned to bed where the image of the beast was now gone. When I got to work I wanted to know the significance of the Seventh Ring. The only thing I could think of that referenced rings was Dante’s Divine Comedy which surfaced recently by chance in a previous dream titled, The Emperian Heaven of the Green Orb so I pulled up the Divine Comedy on Wikipedia and in the section of The Circles of Hell, I found the Seventh Circle. Seventh Circle. This circle houses the violent. Its entry is guarded by the Minotaur. 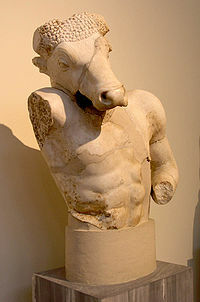 In Greek mythology, the Minotaur (Greek: Μῑνώταυρος, Mīnṓtauros) was a creature that was said to be part man and part bull. It dwelt at the center of the Labyrinth, which was an elaborate maze-like construction built for King Minos of Crete and designed by the architect Daedalus to hold the Minotaur. Here I was lead back to the labyrinth. It was now apparent that the beast I encountered this morning was a Minotaur. Now my question is what is the significance of the labyrinth? I don’t know anything about them other than the fact that they are a maze. In Greek mythology, the Labyrinth (Gk. λαβύρινθος labyrinthos) was an elaborate structure constructed for King Minos of Crete and designed by the legendary artificer Daedalus to hold the Minotaur, a creature that was half man and half bull and which was eventually killed by the Athenian hero Theseus. Daedalus had made the Labyrinth so cunningly that he himself could barely escape it after he built it. Theseus was aided by Ariadne, who provided him with a fateful thread, literally the “clew,” or “clue,” to wind his way back again. The term labyrinth is often used interchangeably with maze, but modern scholars of the subject use a stricter definition. For them, a maze is a tour puzzle in the form of a complex branching passage with choices of path and direction; while a single-path (“unicursal”) labyrinth has only a single Eulerian path to the center. A labyrinth has an unambiguous through-route to the center and back and is not designed to be difficult to navigate. I’ve spent alot of time on the astral plane so I thought I would share a few things here many might find enlightening. Following my near death experience the occurrences of OBE or astral projection is common for me. Its seems when I died I must have left the door between the two worlds open. That seems to be the simplest way of putting it. There are in fact two layers that I have observed in the astral plane as you mentioned and many fearful things (illusions) can be found within the lower layers. Those spirits in the lower layers (they however are real the illusions they create are however not real) are like us on the 3rd dimensional plane, they are unable to see the higher vibrations so they still believe in the idea of control. They being the misguided spirits doing the so called evil. This produces a state of fear and lack which feeds the illusion of evil. Evil is an illusion based on the idea that we can be separate from our creator. This is impossible for nothing outside of God exists. It only exists (the illusion anyways) in the minds of those who believe it. We are self reflective. Inasmuch, anything we believe is projected out and reflected back to us. That is what creates the illusion. Because we are of one mind we can see the illusions of others the closer we are to that vibratory frequency. It is not until our vibration is so high beyond the astral plane and far removed from the base vibrations of the lower astral planes and the density of the 3rd dimension that we become impervious to the illusion. In otherwords, angels that exist well beyond the astral plane and highly ascended spiritual beings are unable by God’s Grace to see our fear based illusions. In essense they only see what is real, they only see that which is good in us. This is God’s Grace. It is a natural veil that protects the angels from being misguided. That’s why our sins or illusions are forgiven by nothing other than God’s Grace. As my awareness increased through exposure to the illusion I was able to see that evil has no real control. Fear is the mechanism through which the dark forces harness energy that we expend on fear. It is an intoxication to the dark lords. It is a drug on the astral plane and many don’t even know it. The greatest threat to the dark side is the spiritual awakening of mankind to it’s true essense. That’s why we as a society are perpetually innundated with distractions through the media and other venues luring us away from the inward journey toward self realization. Confront your fears and don’t run and don’t hide. Instead simply and gently place in your mind the memory of a positive image of a loved one, the birth of a child or the image of a beautiful sunset or a rainbow in the sky or Christ on the Cross. It can be whatever image works for you. It’s as easy as changing the channel on your television set. Hold on to that image and instantly your vibration must respond to your thoughts thereby raising your vibration and you will have let go of fear and it’s hold on your life and your soul will be freed. Fear can only invade your mind if you allow it in. Make no mistake all energy has a felt presense. Energy is neither good or bad it simply is. This is again because nothing outside of God exists. We as spiritual beings are natural conduits for God energy to pass and flow through us. As energy is embued with our thoughts it becomes the substance upon which creation itself is made manefest. That energy embued with our thoughts too becomes self reflective thereby reflecting our thoughts. That’s where the power of creation come in. When we tense up in a state of fear that restricts our ability to conduct the flow of energy. We loose our awareness of God and therefore we feel or percieve what feels like an attack. If we remain calm and at ease with a knowing that nothing can possibly hurt us we soon learn that there is nothing to fear. All fear based illusions simply pass or flow though us. That is what my awareness of the Astral Plane has brought me. I hope it helps someone. Today I had an incredibly powerful experience as I was waking up this morning. As a side note, I’m supposed to give a short inspirational talk later this evening and I’ve been worried about having the right words to say. Well I now definitely know I’m not alone. I’ve learned to follow my dreams down the rabbit hole to see where they lead. They never cease to amaze me. Here is what happened. About an hour before my alarm was set to sound I had the urge to go to the bathroom. I woke up and beside my bed was the spirit of Potamous laying quietly next to me. He turned to make eye contact with me. I acknowledged him as I gazed at his pale blue colored pudgy cheeks. I told him telepathically that I had to get by him to go to the restroom. He then moved to the side to let me by not that he really needed to because he was after all in spirit form. I went to the bathroom to do my business. As is unusual I turned on the lights to see if anything was out of place. The bathroom was normal so I did my business and returned to bed. I picked up my voice recorder to capture what I remembered of the dream I had just had before awaking. I knew I would forget what the words were because they were words I did not perceive to be English. I asked to be shown the words one more time. In sequence the words appeared on the blank page of the journal one by one. I quickly opened my eyes and immediately grabbed my voice recorder and phonetically sounded them out. The first word I knew was a derivative of the word “celestial” but the other two I had no clue what they meant. I figured when I got to work I would do a search and see if I could uncover their meaning. When I got to work the first thing I did was check to see if there were any new messages for me on the Intention Experiment. I stumbled across a post by Dirk Hertveldt titled “Hopi the Rainbow Warriors” In his post he linked to a You Tube video about a Hopi Prophesy. On one of the first screens on that video I caught my third word. I couldn’t believe it. The Warriors of the Rainbow would spread these messages to teach all peoples of Earth or “Elohi.” They would teach them how to live the “Way of the Great Spirit”. There was my word without the “m” at the end. I then did a search for the word Elohim on Wikipedia and to my surprise the word came up. Elohim (אֱלוֹהִים , אלהים ) is a Hebrew word which expresses concepts of divinity. Elohim is the third word in the Hebrew text of Genesis and occurs frequently throughout the Hebrew Bible. Here too Elohim was the third word. The second verse from Exodus 4:16 really rang true with me. It’s message was very similar to the telepathic message that I received “me and you will do this together”. I then continued my search looking up akin. On first glance the word didn’t even register with me as an english word but come to find out it is. Oh my! Is the vision trying to tell me look at the story of Moses and take strength from that example? On with the search and again to my surprise the word Celestian did come up exactly on Wikipedia. Celestian is the god of Stars, Space and Wanderers. Celestian is Neutral Good, but his worshippers may be any alignment of good. His symbol is a black circle set with seven stars. His home plane is the Astral Plane. His colour is black. Neutral Good is known as the “Benefactor” alignment. A neutral good character is guided by his conscience and typically acts altruistically, without regard for or against Lawful precepts such as rules or tradition. A doctor that treats soldiers from both sides in a war would be considered Neutral Good. Examples of neutral good creatures include the Guardinals, a type of celestial. I then marched into the bathroom to get ready for work and the first thing I noticed on the floor of the bathroom was a fallen maple leaf in it’s full fall color clearly displaying the many viens in the leaf. The leaf was not there earlier this morning. Is mother earth trying to tell me something? Today I slept in late but first I had to let the dog out to do his business. When he was done we returned to bed where I began my meditation. I struggled to achieve a deep state of consciousness when all of the sudden I broke through, I saw clear as day two figures neither male nor female, two beings of the highest order. Their complexion was shiny glowing and porcelain in nature. They looked surreal. They were standing gazing at a green orb that remained suspended in the space they held between them. I was invited to gaze at the ball of green light. I knew what I was experiencing was not of the 3rd dimension. I was at the top of it all looking upon every dimension. Everything that ever was and is I knew was contained within this green orb. Outside of us and the orb was nothing but void space. I had never seen the color black so dark black as this. The vision slowly faded and I ran downstairs to look up green orbs on the internet. I thought maybe a search would lead me somewhere. I soon found my way to celestial spheres on Wikipedia and when I scrolled down I found what I was looking for. 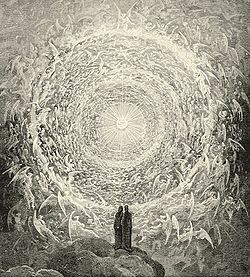 It was a drawing of Dante and Beatrice gazing upon the highest Heaven; from Gustave Doré‘s illustrations to the Divine Comedy Paradiso Canto 31. It was an image hauntingly similar to what I had experienced. The only difference was that the beings and myself were much larger than the orb. I understood that our gazing at it was what held everything in place. The size of the orb was about 6 inches in diameter. This night was too creepy and bizarre in the dream. The night started with my having difficulty falling asleep. It was probably because I had myself a piece of carrot cake before going to bed. Anytime I have something sweet before bed is always a recipe for trouble, but I just couldn’t resist the temptation for a piece of cake. The cake did however help me remain lucid and conscious during most of the dream. The dream starts off with me piloting a see through plane over a great body of water. The body of the plane is made of some form of jelly substance. Joe is with me as my co-pilot. I’m teaching him how to maneuver the plane. With Joe now piloting the plane, we begin having problems staying airborne and I’m not paying attention to what he is doing. The plane comes critically low toward the surface of the water and its belly skirts the sea. I’m then asked to choose as if I’ve played this game before. I somehow know my options. I can either take a reading to see my future or do a retake. Without even thinking, I elect to do a retake. A retake allows me to change the basis upon which my future would be decided. It is a very risky move but has a high payoff if successful. The retake allows me to take possession of my own reading and craft it with my own hands. I am handed a wad of dough with which to form my reading. The wad of dough is transforming before my eyes taking on a life of its own. I am molding it keeping it contained long enough to change the outcome. I notice it begins to grow hair and a face then emerges. It is my face. I feel compassion for who I am. I hear a voice say, “Look, he sees himself.” The face begins to then morph into a wormhole. The wormhole is alive with a mouth like that of an anemone. I place my fingers along the edge of the mouth. The creature begins to draw me into itself. I pull back barely managing to escape. Knowing I’m not alone, I stand and lift my palm to him as rays of blue healing light come streaming forth from my hand. Enveloped by the light the creature begins to shrink and withdraw. It did not however withdraw completely. I never returned to a full sleep as I continued to be on alert expecting it to return. Later in the night it did return once again approaching me in an attempt to menace and intimidate me. Half asleep, I raised my palm above my head again. Once again I could see the blue rays of healing light flow from me through my palm but this time the entity did not back down. It came right up on me and pressed its hand against mine. Startled by the touch, I immediately woke up from my half sleep. As I opened my eyes, I could see the image of the clown floating above my bed. My arm was outstretched preventing him from approaching any closer. The energy was right up against my hand. It slowly dissipated. Having to use the bathroom, I got up out of bed and confidently marched down the hallway to the bathroom, when something odd struck me in the dark hallway. I have a little clown that has legs and arms made of yarn. I have had this clown for more than 25 years. He has always sat on my banister for nearly as long as I have had him. I sit him such that he stratles banister along the hallway where the banister meets the wall. My clown was no longer sitting propped up against the wall but instead midway along the banister. I continued down the hall toward the bathroom. I knew something had moved my clown. I flushed the toilet and proceed down the hall running my hand along the banister. I gently grabbed my clown as I went by and slid him back where he normally sits propped up against the wall. I returned to bed. I then began to meditate. While deep in my meditation I saw a woman slithering like a serpent on her belly. I knew who it was. As she slithered away she raised her head and turned to look at me. As she turned a mirror was raised in the distance and I saw her reflection in the mirror. I then held my hand out in front of my face with my index finger pointing up to indicate the number one. I could see my spirit but my spirit cast no reflection in the mirror. I knew then I was successful at realigning my future. About an hour later my alarm clock rang and I got up to get ready for work. As I walked down the hallway I noticed something else out of place. I have a little stuffed dog that hangs over the banister where the banister turns to head down the stairs. I’ve had him on my banister for more than 17 years. He normally faces the hallway and looks at you as you walk by. Someone had turned him around. Now he was pointing the other way as if to moon me when I walk by. Regarding the Dark Forces, I know it to be a creation based on illusion. It has power only as long as we believe in the illusion. The biggest threat to the Dark Side is our awakening. The day we see ourselves for who we realy are all illusion will fall away. I recently received this message from my friend Sal Rachele who is a gifted channel. He summed it up for us nicely so I will share it here with everyone. I had a dream last night that had a sense of great importance to it. In the dream, I find myself at a town square in a Russian city. I am standing watching the people stroll by through the square. It is so cold here the streets are covered in ice and people are actually ice-skating in order to get around. I notice that the people here don’t seem to be affected by the cold weather. Everyone has a milky complexion, almost ghostly in nature. It then occurs to me that I used to live here at one time. This place was once home to me. There is about to be free for all event that would entitle the winner to the jackpot of winnings. From the top of one of the building along the square the organizers are going to hurl a container out onto the square. The person that is the first to retrieve the container get to keep all of the entire contents. I now find myself at the top of the building with the other organizers of the event. They are showing me the contents. It is a small box, with a copper lid and an ivory bottom. This smaller box is being place in a much larger box 100 times the size of the original box. I can see the larger box now. It is entirely made of copper. The box is rectangular and is almost the size of the town square. I can’t imagine them being able to push that thing far enough to land somewhere in the center of the town square. Someone then pushes the rectangular copper box and it barely makes it over the edge and lands just feet from the edge of the square and is encompassing 2/3rds of the square. The participants down below are confused. They thought they were supposed to scurry to collect the contents of the box but the box has landed larger than life directly in front of them. It literally came to them. They don’t get it. Finally, one guy catches on to the monster sized copper box sitting in front of his eyes. He then takes his index finger and middle finger and taps on the ground two times then places his hand on the copper box. This is all that was needed for anyone to do to claim the prize. He is now the winner. I go down below to speak with him to share in his excitement. He is thinking … “that was too easy”. As I hear his thoughts in my head and my eyes meet his I realize he is me. Why did this dream come with such a great sense of importance? I decided to do a bit of research to see what I might uncover. Copper was obviously a major theme. I know the connection between copper and pennies but did copper have any other significance here. To Wikipedia I go to find out everything I can about copper. • rubedo, reddening: unification of man with god, unification of the limited with the unlimited. I just finished a course on the life of Mary Magdalene. I never had the level of appreciation and respect for her that I do now. I definitely glossed over her importance as I’m sure many Christians have. I do know now that I want to read The Gospel of Mary. The Gospel of Mary is one of the gospels that did not make the cut into the Bible that we know now. One of the reasons I’m sure is because it was from the perspective a woman. She literally was the 12th apostle or more accurately the 1st. One thing is for sure, she was the first to see the risen Christ. I know it was not by chance that Christ revealed himself to her before anyone else. This course illuminated the many theories about Mary and Jesus. Whether you subscribe to the possibilities raised or not it does raise new dimensions of thought surrounding their relationship. It is a love story so incredibly touching and non-traditional it resonates so deeply within my soul. So many things I was simply unaware of. Whether she was a prostitute, a lesbian or whatever else that might give them cause to want to stone her, she suffered greatly alongside Jesus. Having experienced the Crucifixion had to have been heart wrenching for a loved one to endure. I would have been completely devastated then to be taken up so high upon seeing the risen Christ would have been a rollercoaster ride of emotion to say the least. What a beautiful angle to come in on this story. It is so out of the box it is refreshing. It shows a humanness so tender and yet so divine. Last night I had a dream, where I am angry at my brother’s wife Maggie for having disrespected my mother. She is lying about her actions and I want her to come clean and admit and repent of what she has done but she does not she simply continues to lie and deny it. She infuriates me so much I slap her across the face. My brother then walks in and tells her he has finally had it with her. She is begging him to reconsider his actions. My brother refuses and in the heart ache of losing her and the decision which is forced upon him, he locks himself in a vaulted room and turns on the gas. He is about to commit suicide because he can no longer endure the pain. They look at each other through a glass window in the vaulted door. I am driving my mom around in a golf cart to remove her from what she is about to experience; the loss of her son. We ride over to where there are several pools filled with glowing blue waters. My mother is afraid that I’m going to endanger her by driving the cart too close to the edge of the pool. She doesn’t understand the spiritual nature of what she is about to experience by bathing in the refreshing waters of the pools. I am bringing her here to renew her life. I’m trying to reason with her but she is set and determined to remain in her own fear. I then become lucid and realize it is close to the time when I need to wake up to get ready for work. I observe my surroundings within the dream realizing what I have just done. I’m thinking, I’m now going to get phone calls from everyone in the family blaming me for antagonizing the situation by pushing the issue to a confrontation. My alarm clock rings. I wake up thinking sarcastically…..”wonderful dream Ruben.” I snoozed the alarm and laid my head back down to meditate. I immediately began having a vision. A ray of beautiful blue light so intense filled every corner of my vision. The rays of light were broken by something; a shadow in the distance. The light was so intense like the blue torch flame on a welder’s gun yet it did not hurt my eyes. I knew something had to be in the distance obstructing the light that was coming through. I stayed within the divine light for 9 minutes until my alarm clock went off a second time. Again, I hit the snooze button. I returned to my vision where I now saw a bearded man in spirit wearing a long white robe seated with a book on his lap and a pen in one hand. He was writing in his journal. With every couple words that he wrote, he would pause to reflect and meditate on what he had just written. What he was writing was apparently very dear and close to his heart. I could tell by the expression in his face. His fingers gently caressed the pages upon which his pen lay. My alarm sounded a second time. The connections in this dream did not hit me immediately. Even the obvious connection between Magdalene and my sister-in-law Maggie I missed at first. It wasn’t until I began to write that it made perfect sense. I tried to think back to the last time I saw the light as bright as this. It was the time I had the vision of Christ on the Cross surrounded by concentric circles of arched angles. Had I been that close once again to the presence of the Christ Light? Remembering back to the vision of Christ on the Cross where at his feet were kneeling both Mary the mother of God and Mary Magdalene. Yes it was Mary Magdalene whose image was obstructing the light before my eyes this morning. I have to ask myself, if I am Maggie, am I dealing too harshly with myself? Are there things, I’m not admitting to that are keeping me set in my old ways preventing me from renewing my life by bathing in the illuminated waters of the Light of Christ. What can I do today to honor this dream as Christ honored his beloved Magdalene as imperfect and divinely human as she was? Maybe I can look at both Maggies in a different light. I have been pondering the mystery of these Moai referenced in my recent dreams and visions. Anytime synchronicity appears around me it is a clear indication for me to pay close attention to what is happening. The universe is trying to get my attention. This began with my Red Riding Hood vision, followed by the Coneheads, which lead to the Moai’s from Easter Island. Research into the Moai left me speechless when I came across the reference to the Living Faces. So often in my mediations and contemplation on the stars have I seen through the darkness within the minds eye, Living Faces swept by the sea of consciousness. Are these the gods of the stars and the heavens, beings from other dimensions those described by the people of Easter Island? I know there is a Stargate Science here. Within us is a portal to other dimensions. Within us is a mirror of what we experience as out there in the heavens, those bodies of light we call stars. Last night I had a dream where I am living back at my old house which I’m once again renting from Larry. Except this is not the house we had on Mount Washington it is the house on 12th Street. Now I am the primary person on the rental lease agreement so I am in charge of the house. I can have the pick of rooms where I want to set my bedroom. I have reserved the entire 3rd floor of the house for myself. As I walk through the house, I realize how expansive and big this house really is. Many of the rooms are fully furnished but hardly ever used. I now live there by myself and two other guests. Even with the two guests in the house it still has many rooms to spare. I am thinking I could easily make a living by renting the rooms of this house and never have to work again. I mention this to one of my guests who is staying in a room on the 2nd level of the house. His current room is very unique in that the walls of the room are similar to the oriental style room partitions that are used as room dividers made of large square lattice and rice paper. It reminds me of being in a confessional. I tell him I’m thinking of renting out one of the bedrooms on the 3rd floor and offer up my space to be shared with someone. He asks me if I would allow him to exchange his room for my offering on the 3rd floor. I agree to allow him to use it. I decide to give him the room at the rear of the third floor. As I’m walking there to show him the room he asks me how much money I want as rent. I have no idea? I guess something like $400. He says, that I am currently charging him $1400. I then tell him that he should then continue to pay $1400. He asks me how much do you pay for the entire space. Out of somewhere unknown I pull up the figure, $4,200. I then realize I had forgotten that the house is inhabited by many spirits who often hold assemblies. The assemblies are known as the Assemblies of Light. I forgot to mention this to him. As that thought crosses my mind, I see one of the assembly members wearing a red hooded cloak come rushing toward me. He bumps into me as he hurriedly dashes by. How am I going to introduce this twist of fate to him? 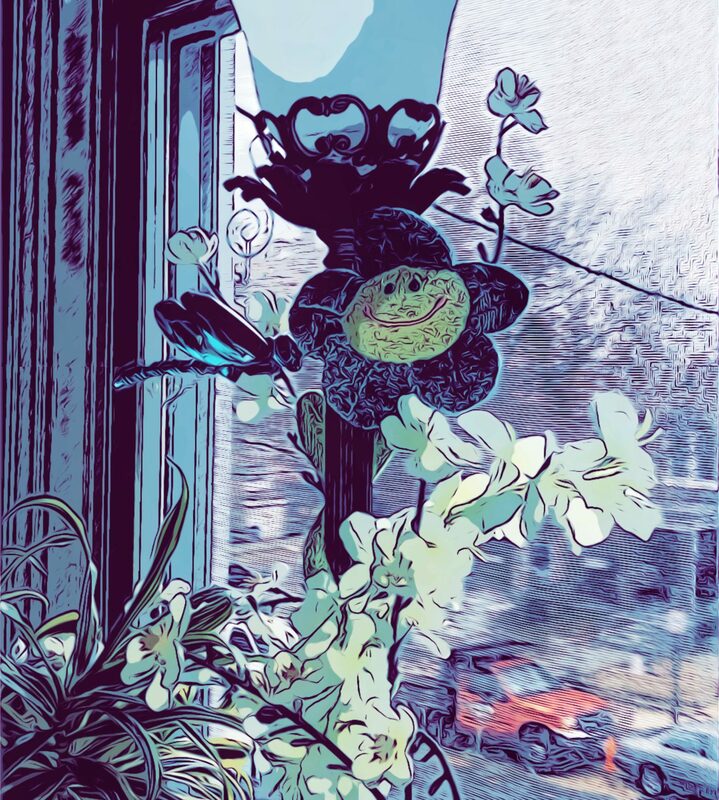 Up in the back room of the house in the room he would be occupying is a middle aged man who every morning sticks his head out the window to play his wooden pipe which he plays like a bull’s horn. It plays an intoxicating melody that serves as a call and signal for the ears to hear. It is a call from a bell tower. In the corner of the room is a wooden box which is mounted on the wall like a light switch. It has the appearance of a coffin. I open the lid to reveal a bi-fold door. With the release of each fold the entire 3rd floor of the house magically becomes bigger, deeper and wider adding dimensions and perspective that were not originally present. This place is now bigger and greater than it ever was before. I’m thinking this must be their secret on how they fit so many attendees at their gatherings. I am in utter amazement at the new size of the space. This place is incredibly beautiful. The furniture and décor is exactly to my style and liking. There are rich deep colored woods and it has a very earthy feel. It is a place for a king to reside. As I step into this expansive space to experience its beauty I realize I am suspended in mid air at it’s center. I have an incredible sense of freedom yet I am unable to move forward, backward, up or down or any direction for that matter. I am simply suspended at its’ core. In that moment I begin to awaken from the dream becoming lucid. I look at my surroundings with now a lucid awareness as I gently open my eyes to see where I am. I am in bed in my bedroom. With my eyes open I am holding both dimensions in my awareness simultaneously. I needed to pee but I remained calm for as long as my consciousness would allow me to hold both realities in my conscious awareness. Slowly and gently the other dimensions began to fade. In the distance I can see a very large gathering of the Assemblies of Light who have gathered to cheer me on. Hey stand in the distance with their arms stretched high swaying back and forth as my room once again returned to its normal size.